It is a hot summer afternoon and you are looking for a place to chill. There is no better way to take advantage of the beautiful summer weather than relaxing on the best backyard hammock. Whether you are sunbathing or lazing gazing at palm trees while sipping on piña coladas, there is no substitute for a hammock. A hammock provides a degree of relaxation you cannot get with anything else, whether you use it with a stand on a patio or hang it between trees. They not only make it possible for you to enjoy your Sunday afternoons reading novels or having a siesta but also come in handy in warmer climates. Check out the following variety of ​​outdoor hammocks that are simple, comfortable, and light. There are a lot of different products available on the market. Choosing one can be a chore if you have to go through hundreds of products to find the best one. Fortunately, we've narrowed down the options for you. Here we have 6 of the backyard hammocks you can choose from. Among these 6, one stands out. This is the Prime Garden 13 FT Poolside. This attractive hammock is waterproof and provides UV and stain resistance. It's a durable hammock which is toxin-free and easy to clean too. The materials of the hammock make it soft to the touch but strong. It also comes with a chain kit for hanging and cotton ropes. These features ensure your safety and stability while on the hammock. 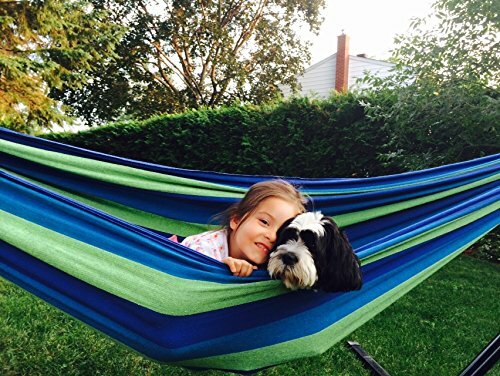 If you're looking for a hammock which is also suitable for your kids or pets, then the Hammock Sky Brazilian Double Hammock is the one for you. It's a comfortable hammock which can accommodate 2 people. The Pawley’s Island Original Collection Large DuraCord Rope Hammock is most ideal for the outdoors. 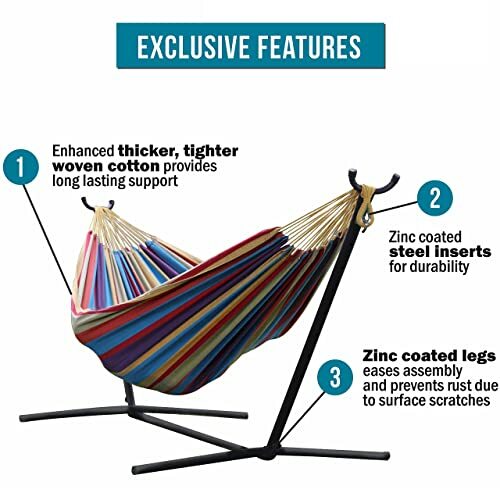 It's a long-lasting hammock which has zinc-plated hardware for hanging. It's the best choice for a hammock you want to set up outside. The best wide hammock to get is the Best Choice Products Hammock Quilted Fabric with Pillow. It has a wide frame and it even comes with a pillow to add to your comfort. This heavy-duty hammock is also sturdy enough to carry 2 people. You can choose the Hammocks Rada Handmade Matrimonial Size Yucatan Hammock if you're looking for a handwoven product. It's durable, comfortable and comes in bright, tropical colors. But if you're searching for a hammock which has its own stand, then the Vivere Double Hammock is the right one for you. It comes with a steel stand and a carrying case too. It's a stylish hammock which offers comfort and durability. This Brazilian hammock is light and takes up little space. Therefore, it comes with a bag that makes it easy to carry. It has a lifetime warranty from Hammock Sky. You can easily replace it for any reason. It is colorful, quite attractive, and can go quite well with the décor in your backyard. You can cuddle up with your fiancé with this double hammock while sipping on margaritas thinking about your honeymoon. It’s made from the highest quality of cotton thread that can last long. 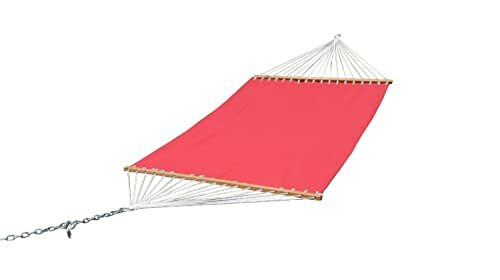 They come in handy as bed replacements whereas other people prefer using them as outdoor hammocks in their backyard or patio. This handwoven rope hammock combines comfort and performance together making it attractive to many. Pawley’s Island is popular for its original rope-style hammocks that are available in single person size. The DuraCord hammock can support a combined weight of 450 pounds. It is made from the highest quality material that makes it superior for the outdoor and backyard environment. It has well-designed stretcher bars that provide a comfortable sway and stability. Best Choice provides a quilted hammock that comes with a soft detachable pillow that makes it possible to swing in comfort. 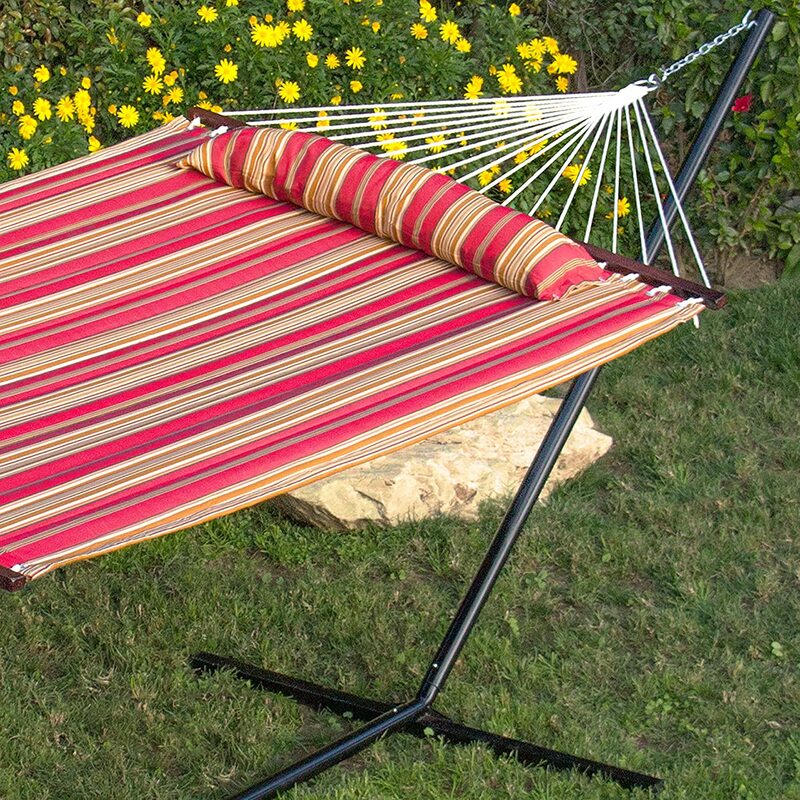 The heavy-duty fabric on this double size hammock accentuates your backyard. The fabric used has UV-resistant dye. It combines detachable suspension springs that you can use to hang on a wall. You may have to buy a stand separately if you do not want to hand this between trees in your backyard. 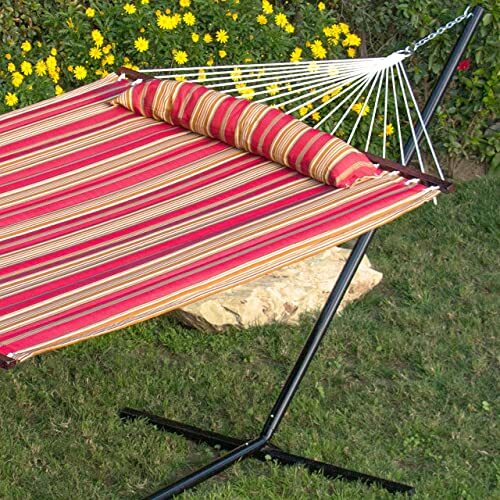 This broad, bed-like hammock features a hardwood spreader on both ends making it sturdy. Therefore, it can support a weight capacity of 450 pounds allowing up to two individuals to kick it back and relax. This is a hand-woven Mayan hammock that features tropical colors making it aesthetically pleasing. It has a comfortable design that makes it easy for you to ease into relaxation. You can sunbathe, read, or have your siesta on this high-quality hammock anytime. The design allows you to lay horizontally or lengthwise to get the ultimate comfort. You can easily swap it for your old mattress. It comes with reinforced mounting loops for hanging. It can support two people with a combined weight capacity of 550 pounds. This is certainly one of the ​finest backyard hammocks. The Prime Garden Poolside Hammock features a colorful design pattern that is attractive to the eye and adds to the beauty of your backyard pool. Sunbath in this large and soft 13 feet hammock that is waterproof and UV resistant. With the solid wood spreader and 18 cotton ropes, there is assurance that this hammock will last for generations to come. It is large enough to accommodate two adults, so you can bring your cuddling friend with you. The fabric used is easy to clean you do not have to worry about it catching dirt. Made from a long-lasting cotton fabric that is easy to clean, free from toxins, resistant to UV rays, waterproof, and stain resistance ensuring it lasts longer. Combination of vinyl coated polyester and solution dyed acrylic in the fabric makes it soft, durable, and strong. Has 18 cotton ropes linking the hardwood spreader bars that ensure there are optimum stability and safety. Has a tasteful color combination that makes it very attractive. Hammock that provides superior comfort. The stand has plastic caps on both ends to provide a smooth finish. You can easily set it up anywhere without depending on trees in your backyard. With a weight capacity of 450 pounds, it can easily support two adults. Comes with a space-saving steel stand made from steel that makes it strong and secure. Light steel stand that is easy to move and pack into a carrying case. Made from 100% breathable denim cotton fabric that ensures ultimate comfort. Colorfully styled cotton fabric that will carry you away with its beauty. Hammocks provide an alternative to sleeping on the ground where you are more likely to wake up with ungodly creatures sharing your sleeping bag. Therefore, it is critical to select the right hammock. Selecting a hammock is not as easy as finding a net that can stretch between two poles or trees. Choosing the best backyard hammock will give you extreme comfort and relaxation. Selecting the right type of hammock that suits your needs and locations ensures that it lasts longer and gets you into a state of relaxation much faster. Hammocks come in different designs and appearances suited for different conditions. For example using a quilted hammock in the summer heat of Georgia will leave you hot and uncomfortable. They are suitable for people in cooler climates and suitable for use in the autumn or early spring. It is made from solid fabric that has no stitching gaps or holes offering softness, comfort, and extra warmth. They are ideal for cooler climates and come with spreader bars that provide stability. These hammocks are great for families with little kids. Have a similar design to quilted hammocks but have rope stitching between the spreader bars. Materials used are either cotton or polyester. Rope hammocks are great for sunbathing at the beach but not suitable for kids because of the large gaps in the weaving. Brightly colored hammocks made from cotton or nylon with breathable stitches. They are flexible and adjust to fit your body size. Mayan hammocks are suitable for campers since they are light to carry. However, they do not come with spreader bars. These handwoven cotton hammocks come in a range of colors. They have a luxurious look and come with spreader bars. These are made from a solid weave that makes it suitable for families with little ones. They are easy on the eyes and feature fringing that makes them quite attractive. Nicaraguan hammocks are made from tightly stitched but breathable cotton. They do not come with spreader bars. You can hang them from trees, rafters, beams or stands. Poolside hammocks are made from water-resistant materials making them ideal for poolside relaxation. They are additionally suitable in warm climates and on the beach. Usually, come with spreader bars. You can easily hang your hammock between trees or poles. However, there are instances that may require you to use a stand, for example, going to a car campsite that does not have any tree or pole. You cannot be certain if there are any poles or trees from which to hang your hammock and enjoy a snuggly night. Some hammocks come with stands that you can use instead of a pole or tree. Stands come in handy at home if you want to relax on your patio or if you are going car camping. One of the most difficult things to do is selecting the best location for your hammock. You may not have the best-spaced palm trees in your property but may have one or two hardwoods that will support your weight. The spacing between the trees should be such that the hammock fully spreads. Shorter spacing distances mean that the underside of your hammock will touch the ground. Greater spacing distances also mean that you will have to use an extra rope to extend the hammock’s reach. Use a spreader bar to solve the latter problem and prevent the hammock from ripping. It is vital to ensure your hammock has a secure connection on both ends. You can use tree-fastening straps that will not cause harm to the tree while remaining effective. Traditional hammocks can loosely hang between two trees with a dipping center. With this type of hammock, you can use branches and tree trunks that provide enough support. You can then easily hang your traditional hammock at points 6-8 feet high on the available trees. On the other hand, hammocks with spreader bars can hang only between 4 and 5 feet high. They hang tightly when occupied making them parallel with the ground, unlike traditional hammocks that hang loosely. You can measure the spot for hanging your hammock based on the hammock’s style and size. Hammocks generally require between 10-15 feet of space to stretch out. You can pre-measure the distance of spreader hammocks based on their length. The preferable distance for this type of hammock is about 13 feet. You can take into account an extra foot to adjust the hammock’s tension based on your needs. Hammocks without spreader bars are much easy to set up because they hang with a slumped arch instead of being tight and flat. You can hang them between poles slightly shorter apart than the length of the hammock. These are the fastest and simplest ways of hanging your hammock. You can easily adjust the strap distance without damaging trees. They are light, therefore easy to carry around making them ideal for camping. This method makes it easy to adjust the tension of your hammock. You require two strong anchor walls, two lengths of chain, and two large s-hooks. It’s suitable for indoor hammocks. Hammock stands are easy to use for hanging. All you need is a hammock and you can start chilling. You can choose to buy a hammock together with a stand or buy one separately. The choice is yours! The best backyard hammocks feature durability, comfort, sturdiness, and attractiveness. The Hammock Sky Brazilian Hammock is a light and attractive hammock that is easy to carry making it also suitable for camping. Pawley’s Island DuraCord Rope Hammoc﻿﻿﻿﻿﻿k features handwoven cotton that makes it very comfortable and durable for use in the outdoors. Best Choice Quilted Hammock comes with a detachable pillow that makes it possible to swing away in comfort. The hardwood spreaders make it quite sturdy for use. 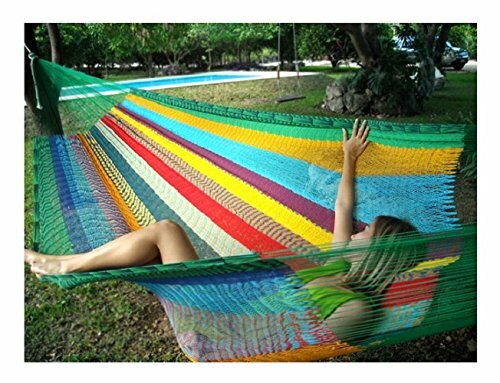 The Hammocks Rada Yucatan Hammock comes in a beautiful tropical multicolor fabric, handwoven with the best cotton providing the ultimate durability and comfort. On the other hand, the Prime Garden Poolside Hammock features a waterproof and UV resistant cotton fabric that makes it attractive for use as a poolside hammock. It is also very easy to clean. Our clear winner here is The Vivere Double Hammock. It comes with a space saving steel stand so you do not have to worry about supporting yourself on trees. It is very easy to move and you can place it anywhere in your backyard or porch. It is made from breathable cotton and comes in very attractive colors. It easily supports 2 people weighing up to 450 pounds. All these attractive features makes it a recommended buy.